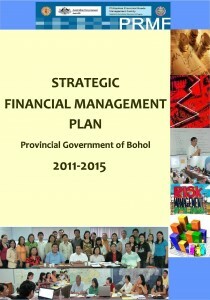 The Strategic Financial Management Plan (SFMP) of Bohol shows the direction of the provincial government in the generation and utilization of financial resources for 2011 to 2015. It is the result of a combined process of analyzing the historical data on past performance scanning both the internal and external environment of the province. Includes provincial fiscal profile; financial management strengths, weaknesses, opportunities and threats (SWOT), financial management development plan, and implementation mechanism and plan of actions. Also includes financial tables, an assessment report on public financial management (PFM), an Integrity Development Action Plan (IDAP), a revenue generation plan, a capacity development plan, and a monitoring and evaluation plan. Available in PDF and can be downloaded through the link below. I had read your report, and I’d noticed that the PFM Assessment report is missing. I’m currently writing my thesis regrading Strategic Financial Mgt Plan for a certain City in Neg. Occ. and I’m kinda curious on how did you come up with your PFM Assessment ratings on page 34. are there any PFM assessment tool or questionnaires readily available? or do i need to work for it? I’m really interested to know everything ’bout your report sir. Would love to hear more from you. You can reach me at karlphillips118@gmail.com thanks sir! God bless. The PFM Assessment is the result of the PFM Assessment Tool which can be found at the DBM website. This is an assessment for LGUs and this will evaluate different financial areas like planning, budgeting, treasury, accounting and internal auditing. The tool is made up of questions which represent the processes involved in the stated areas. The matrix on p. 34 is just the summary. To get the tool, you can go to the DBM website. You can even google PFMAT and it will take you to the tool.